Wheeeeee! 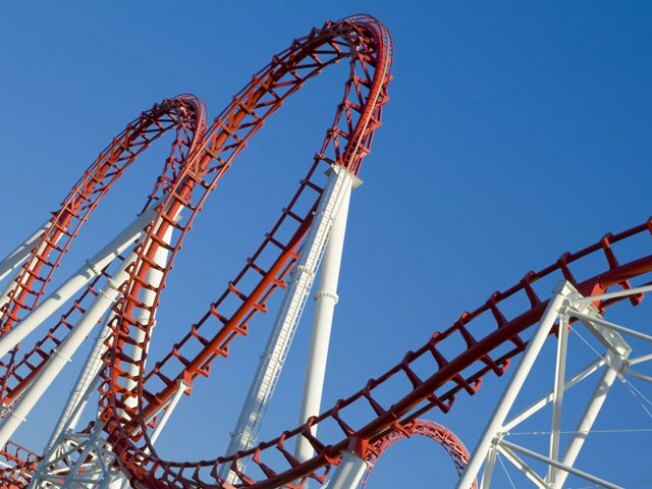 Financial meltdowns are our favorite roller coaster! Woooosh! That's the sound of money flying out of Six Flags' bank account. We're getting the feeling that maybe Six Flags HASN’T REALLY TURNED IT AROUND? Team Snydiro -- Chairman Dan Snyder and CEO Mark Shapiro -- have now been telling the world for almost four years that Six Flags has gotten things together. Today, more proof that Six Flags hasn’t gotten things together. Shapiro emerged from hiding this morning to release another set of dismal financial figures for the bankrupt Six Flags, these from the second quarter 2009. This report, like every report the company has issued since Snyder took over the company in late 2005 amid big boasts of how he was going to right the ship, contained awful numbers. Six Flags, already more than $2 billion in debt, lost another $121.6 million. Also as with previous releases, Snydiro blamed everything and everybody but themselves and their management for the company’s atrocious fiscal state. God and governments were particularly culpable, according to Snydiro. “Our decline in performance is a reflection of all that surrounds Six Flags -- a severe recession, a balance sheet restructuring process, the swine flu pandemic, adverse foreign currency impact at our international parks and miserable weather, particularly at our East Coast parks,” Shapiro said in a statement. Snydiro also fingered the “timing of Easter” and the “minimum wage increase” as factors in the rock-bottom bottom line he and Snyder showed the More Flags, More Fun! investors. Teensy quibble, Snydiro: The Federal minimum wage went from $6.55 to $7.25 a week on JULY 24, 2009! Geez, this same ol’ whine from Six Flags management has got me sleepy. Good thing that during the second quarter, amid the bankrupty filings and dealing with the lack of a raise in the minimum wage and all things just sinking more to hell, Snydiro started selling an Official Mattress of Six Flags! Keep the dial right here for all the breaking news in Dan Snyder’s Six Flags soap opera!